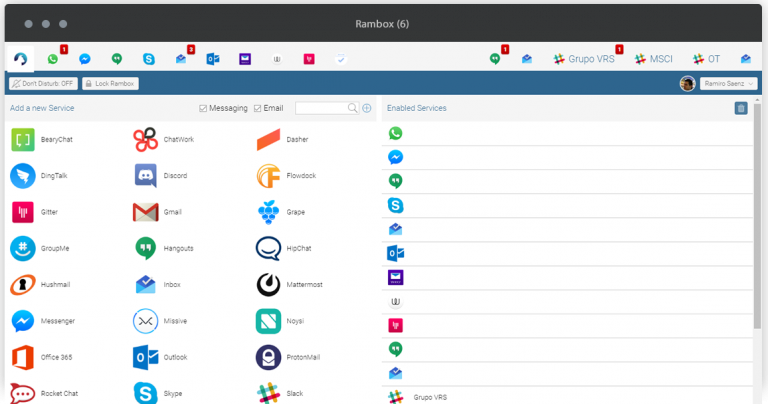 Rambox is a smart tool which enables accessing all your messaging and email services from a single cross-platform Electron-based app. We really do mean all. The program opens with icons for 90+ supported services: Flock, Gmail, Hangouts, Hootsuite, Hushmail, iCloud Mail, ICQ, LinkedIn Messaging, Outlook, Outlook 365, Pushbullet, Skype, Slack, SquirrelMail, Steam Chat, TweetDeck, WhatsApp, Yahoo! Mail, Yahoo! Messenger, Zimbra and more -- and you can add as many others as you need. Click a few services and you can add them as tabs. These may be grouped and reordered to help you organize and switch between them. Rambox can be left running in the background, optionally minimizing to your system tray. When there’s something new to check, a native desktop notification lets you know. Or if you’re working in Rambox, a badge appears in the tab where something has happened. You could do this with separate apps, but what’s convenient about Rambox is the way it enables managing all your communications services from one place. If you’re too busy for distracting sounds and notifications, for instance, tapping Don’t Disturb turns them all off instantly. Concerned about privacy? Setting Rambox’s master password prevents launching the program until the password is entered. It’s also possible to lock access to Rambox if you’ll be away for a while. As usual with Electron-based apps, Rambox is available for Windows, Mac and Linux. Spend some time configuring the app on one computer and you can sync the settings with every other. Although it’s not highlighted in the interface, Rambox can easily be extended with other web services. To check this out, scroll to the bottom of the service list and click Add Custom Service. If a service disconnects when you’re inactive for a while, for instance, you can have Rambox automatically refresh the page at regular intervals. Here’s the code you’d use to refresh a service every ten minutes. Desktop versions of web apps don’t usually work for us, but Rambox’s lengthy list of supported services, configurability and useful bonus features help it stand out from the crowd. Give it a try. Rambox is available for Windows, Linux and Mac.